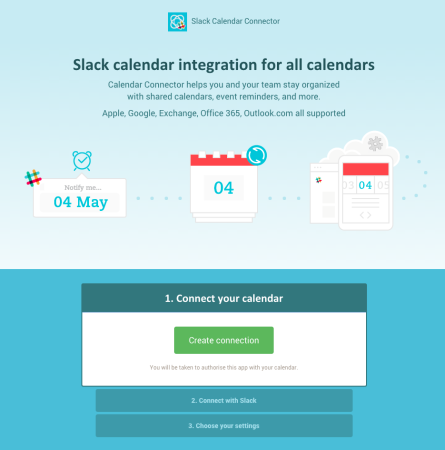 A few months ago Slack announced Google Calendar integration, so we decided to take it a step further and add Apple iCloud, Office 365, Microsoft Exchange and Outlook.com integration for Slack users too, in the form of the Cronofy Calendar Connector. Using the Cronofy Calendar Connector for Slack you can make sure that anyone in your channels can post reminders before an event starts and post updates when an event changes. It’s really easy to install and use – simply head to the Cronofy Calendar Connector page in the Slack App Directory, or visit slack.cronofy.com. Three clicks later, you’re ready to go! All your team benefits from the Slack Calendar Connector, so no matter which calendar service(s) they prefer to use and how many calendars they have, they enjoy seamless event reminders and updates. You can set custom reminders before events, get daily and weekly digests, get private reminders about events (simply use @slackbot to keep them to yourself), and choose which of your calendars and channels are integrated. You have full control over event reminders, updates, times, digests, and more. There are no limits on how many users or calendars can be connected, so go crazy. It’s completely free. Using the Calendar Connector? Please let us know what you think by emailing hello@cronofy.com or tweeting us @cronofy. If you’re an Evernote, Eventbrite or Zendesk user, we have a lot more calendar joy for you. Check out our list of calendar integration apps. If you use Trello to manage your projects you might want to try our Trello Calendar Connector. It’s now an official Trello Power-Up!